Any idea about glands and ducts of our body? A gland is an organ which involves secretion of chemical substances. Whereas, a duct is a tube-like structure which helps in transfering the secretions/cells, etc. to various body parts. 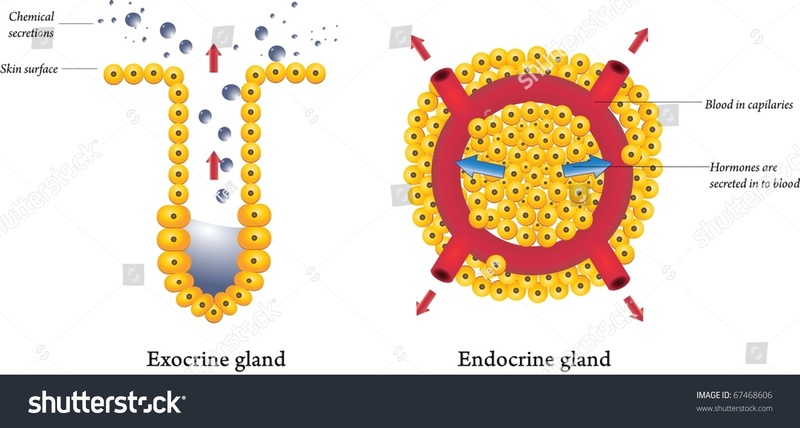 Glands are of two types: Exocrine and Endocrine. Salivary glands, Liver are large exocrine glands; sweat glands are also exocrine in nature. These are drained by ducts to carry away secretory materials to designated surface/lumen. Endocrine glands are without outlet, i.e. there is no duct to drain the secretory product. Endocrine secretions are directly transferred to blood and hence the secretions can reach various local/distant tissues and influence their functions. Ducts are anatomically important structures not only to drain secretory materials like digestive juices, or sweat but these are also important in draining products like urine, tear, milk, etc. Then there are ducts which carry gametes, e.g. oviduct, vasa efferentia, etc. How do hormones differ from enzymes and neurotransmitters? How is the endocrine system related to the nervous system? How do endocrine glands help maintain homeostasis? What are some examples of the fight-or-flight response? How do endorphins affect our emotions? How many axons does a neuron have?